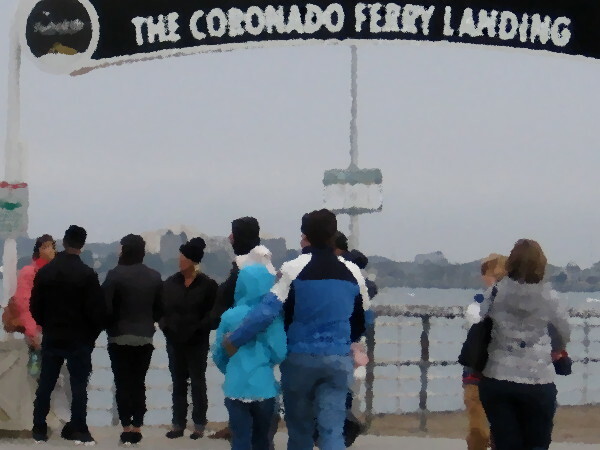 coronado ferry – Cool San Diego Sights! 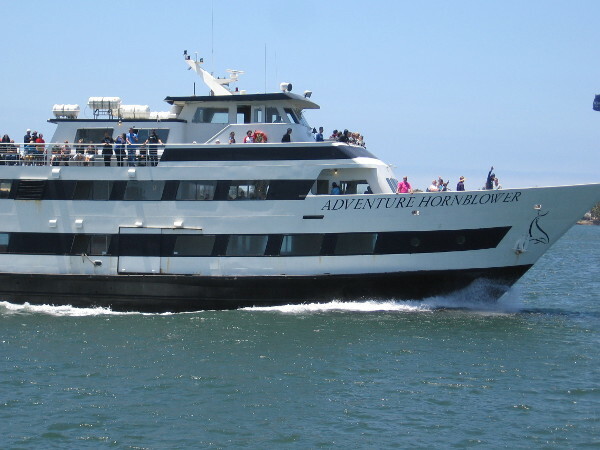 Taking the ferry from downtown San Diego to Coronado is like crossing into a dream. It’s a journey to a magical place. The island is like a small, carefree paradise. 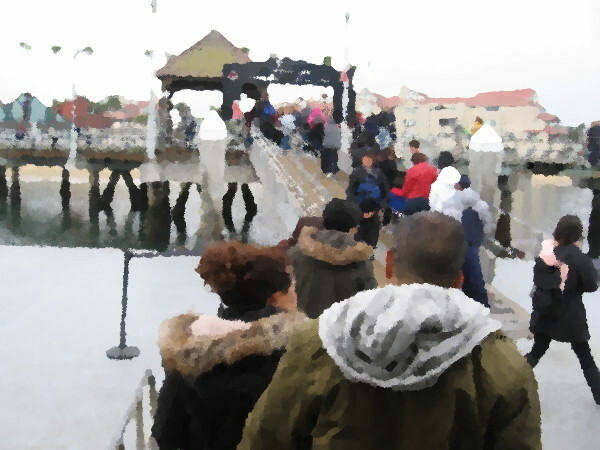 I had a variety of photos from my ferry ride and walk yesterday, so I thought I’d try converting a few into oil paintings! 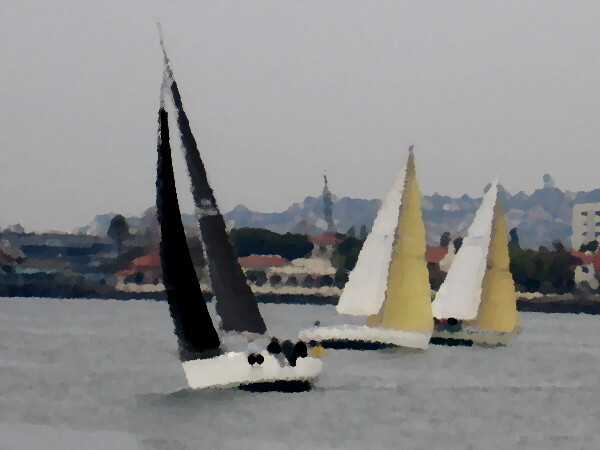 I cropped selected images then used the Oilify artistic filter that comes with the GIMP graphics editor. It was a beautiful misty winter day. 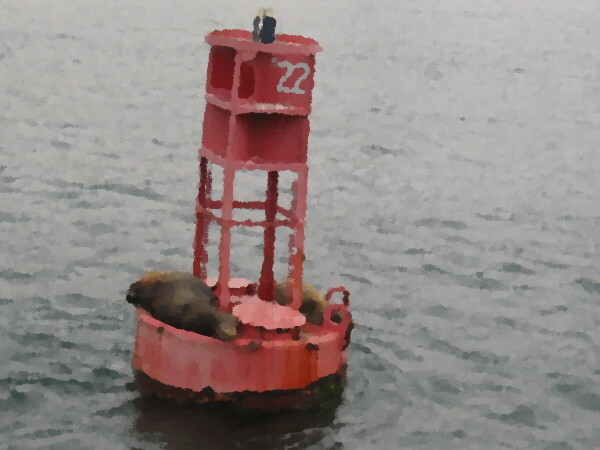 Those are sea lions lying on a buoy in the bay! 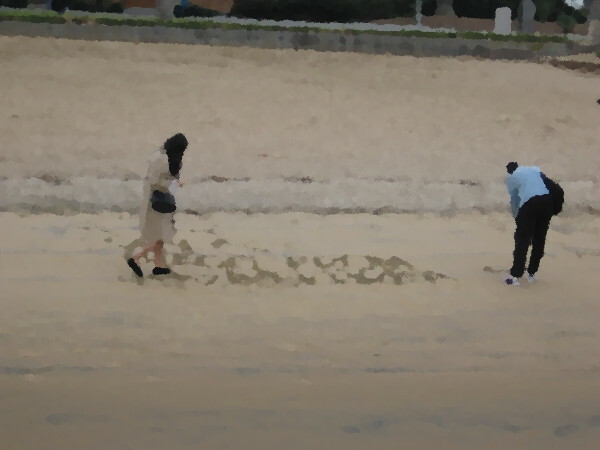 The words etched in the sand near the Coronado Ferry Landing? I’ll let you decide. Another fine summer walk in San Diego. 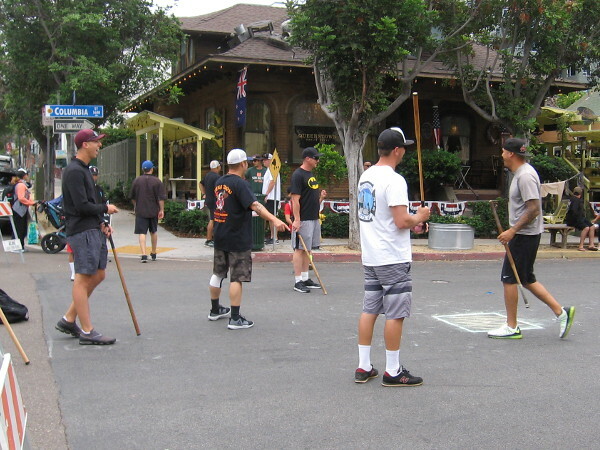 Six teams of firefighters from California play stickball in Little Italy on a fine summer Sunday. My walk today began on Cortez Hill and proceeded down through Little Italy until I reached the Embarcadero. I then headed south along the water. It’s a simple walk that never gets old. Good times on Columbia Street. 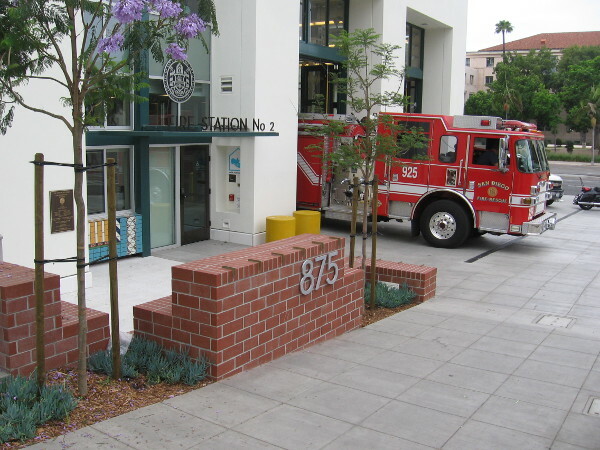 Bayside Fire Station No. 2 is finally open! A friendly firefighter told me the engines arrived on Friday! 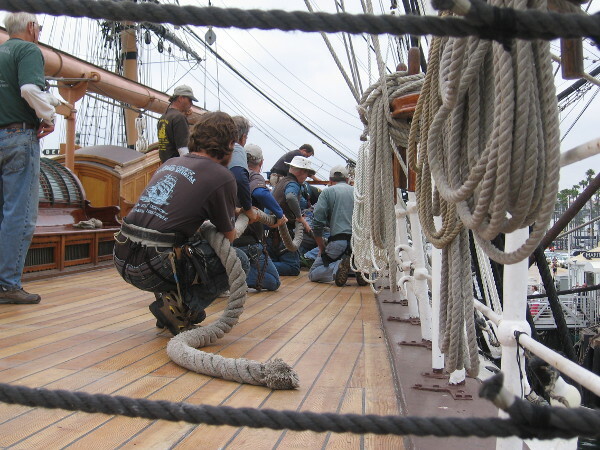 Volunteers pull a huge rope together on the deck of Star of India. 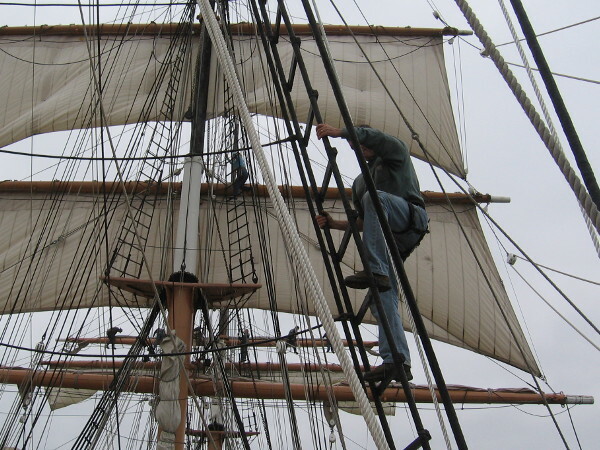 Climbing up into clouds of sail. 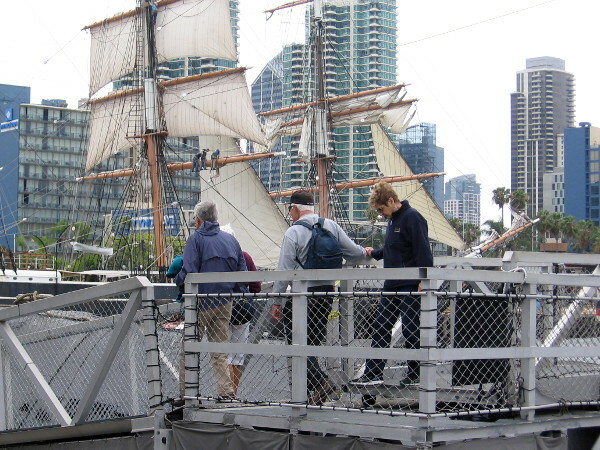 Visitors to the Maritime Museum of San Diego exit from the Soviet submarine. 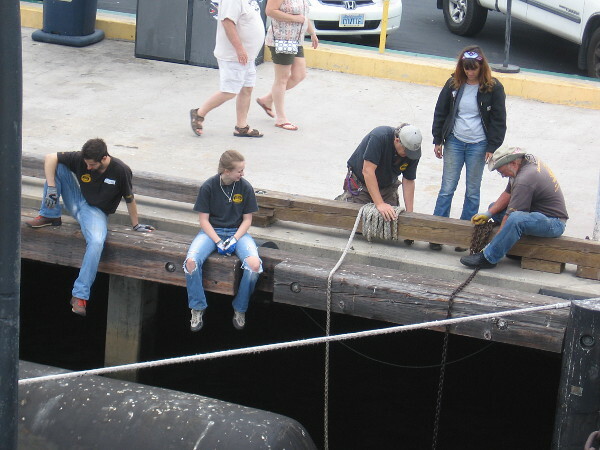 More museum volunteers handling ropes and chains by the water. 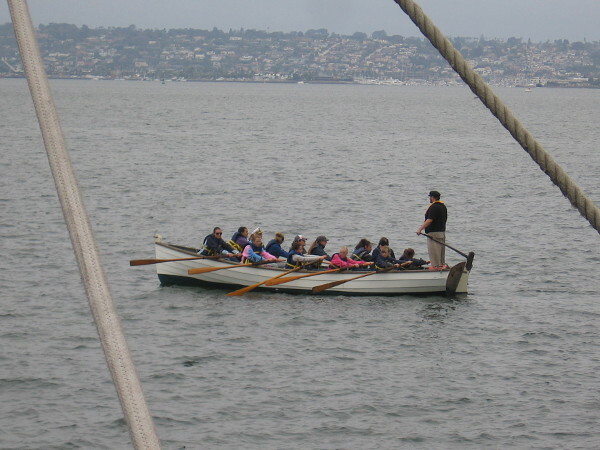 The museum’s longboat was out on San Diego Bay. An overcast but very pleasant start to the morning. Two huge ships at the Cruise Ship Terminal. 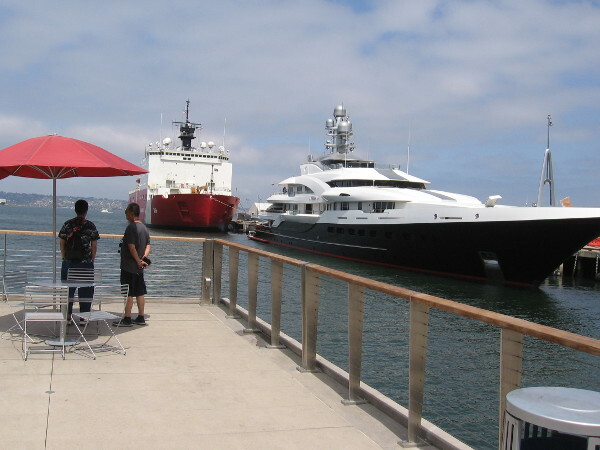 The superyacht Attessa IV and impressive U. S. Coast Guard cutter Healy (WAGB-20). 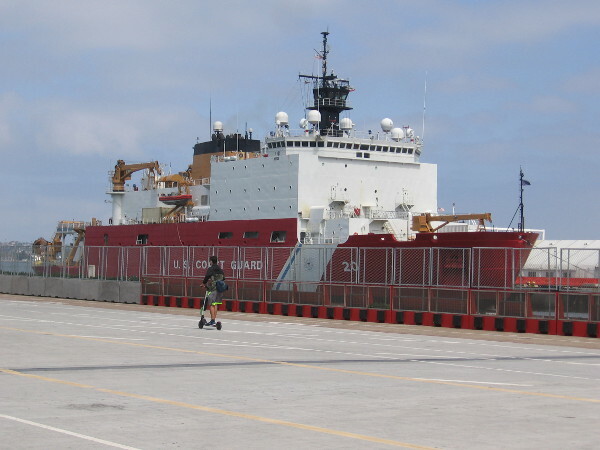 Someone rides a scooter along Broadway Pier past the Coast Guard’s newest, most advanced polar icebreaker. I haven’t spotted any ice off San Diego! 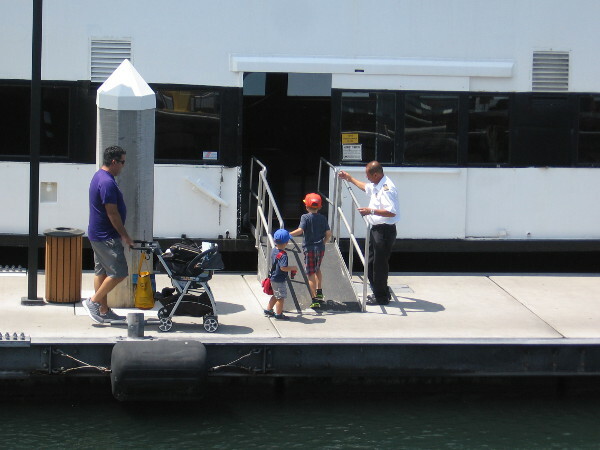 Family boards a Coronado ferry near Broadway Pier. 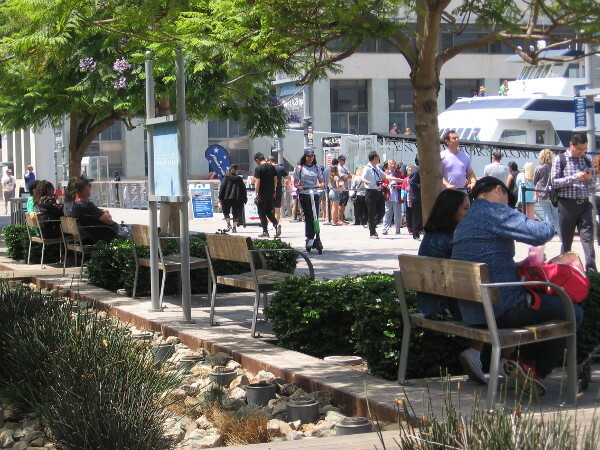 Many people were out on the Embarcadero today enjoying wonderful San Diego. America, replica of the racing yacht that won the first America’s Cup, cruises past. And so does a sailboat. Walking and sitting above the shining water. Out on a harbor cruise. Simply standing by the blue water. 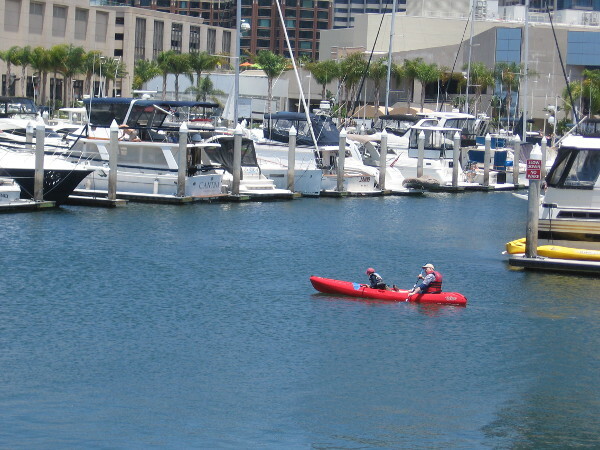 An easy float through the Marriott Marina. 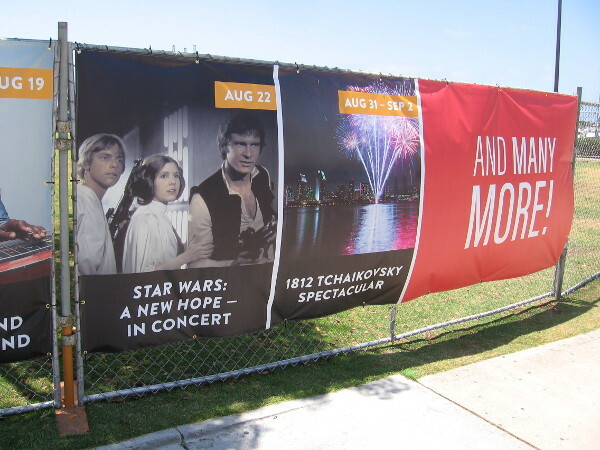 The San Diego Symphony is set up and ready to go for their outdoor summer concerts at Embarcadero Marina Park South. Bayside Summer Nights will feature lots of great concerts, and fireworks. On the water in a boat, and above it on a pier. 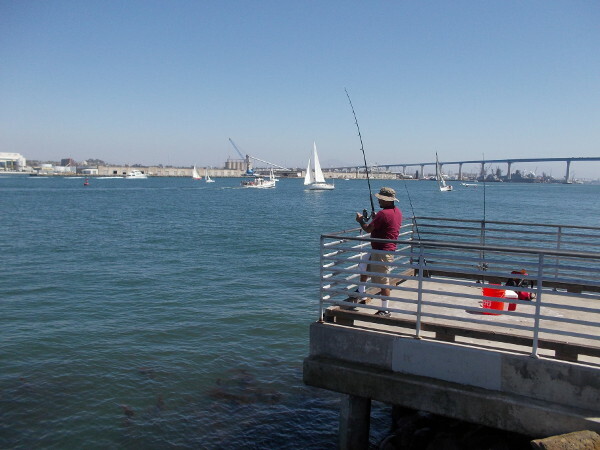 I see the Coronado Island Marriott Resort beyond those fishermen. 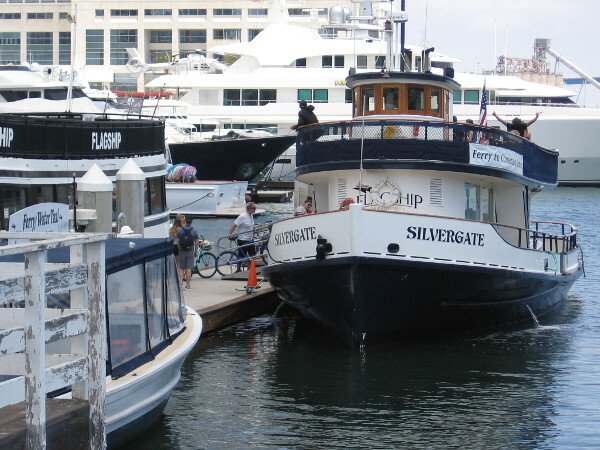 And here’s my favorite Coronado ferry, Silvergate. 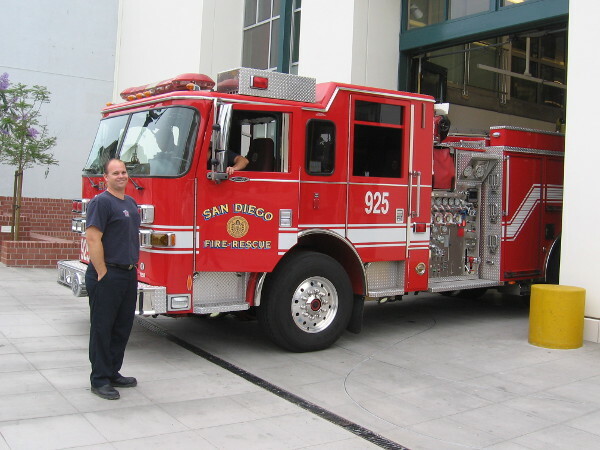 It usually departs near the San Diego Convention Center. 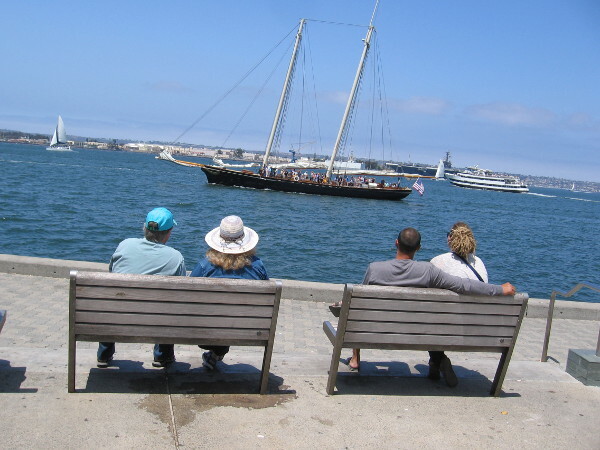 Posted on June 24, 2018 June 25, 2018 Tags coast guard, coronado ferry, embarcadero, firefighters, maritime museum, piers, san diego, san diego bay, san diego symphony, ships, stickball, summer, walking, waterLeave a comment on Another fine summer walk in San Diego. Beautiful ferry mosaic on Coronado Walgreens. Mosaic on Walgreens building in Coronado depicts an old ferry crossing San Diego Bay. 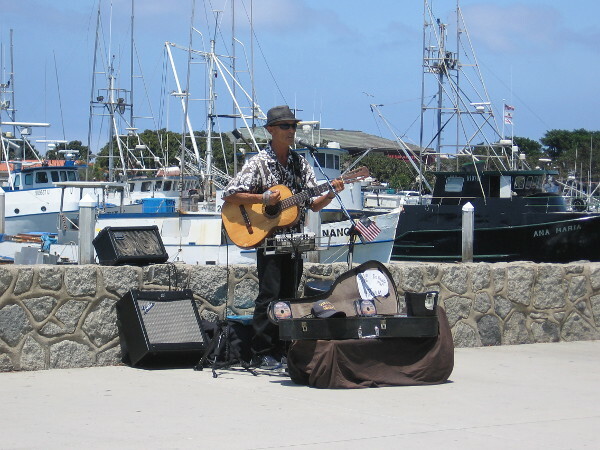 Last weekend during my walk through Coronado I noticed a really beautiful work of art. 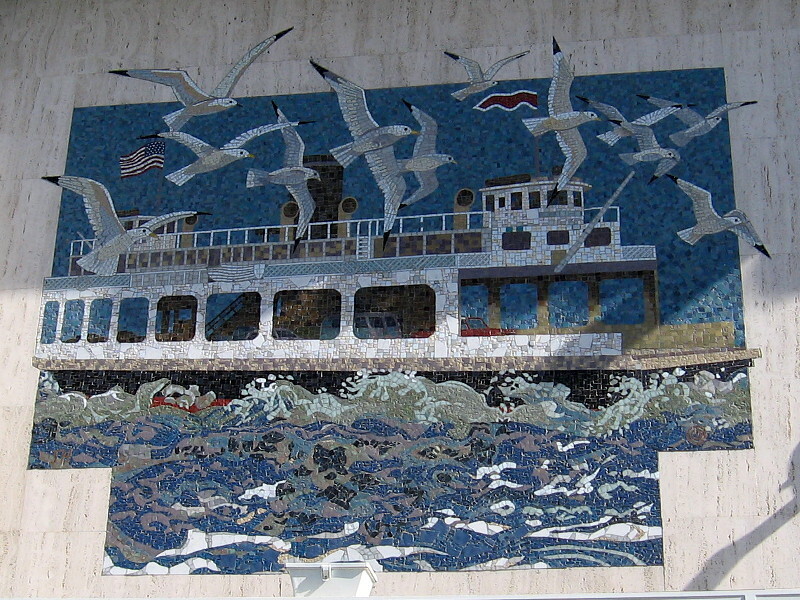 A colorful mosaic, set into the travertine exterior of the Walgreens building on Orange Avenue, depicts a ferry crossing San Diego Bay crowned by a flock of seagulls. According to my limited research, it appears that the mosaic was created in 1985 by Susan Hertel and Denis O’Connor, in collaboration with Millard Owen Sheets, who designed many Home Savings of America bank branches in California. 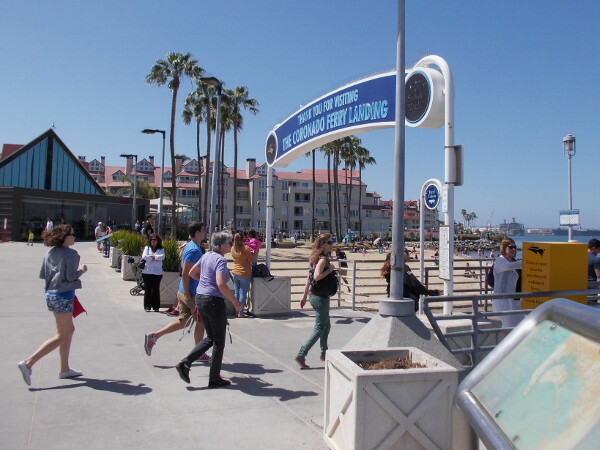 The mosaic represents one of the historic ferryboats that once transported cars between Coronado and San Diego. 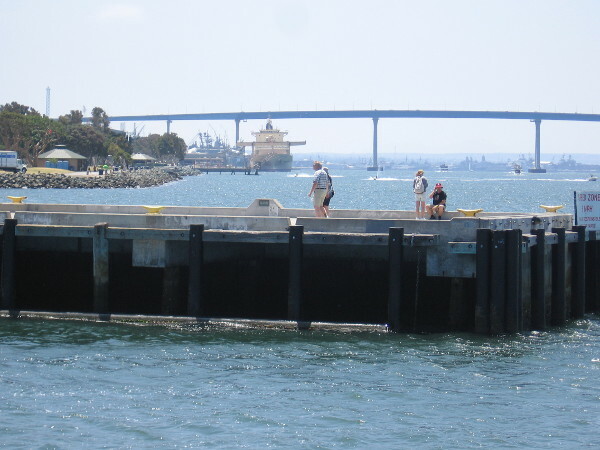 Ferries for cars operated until 1969, the year the San Diego–Coronado Bridge opened. When the artwork debuted, the building at 925 Orange Avenue was a Home Savings branch. Subsequently it became a Petco. As building occupants have come and gone, the extraordinary mosaic has been preserved. 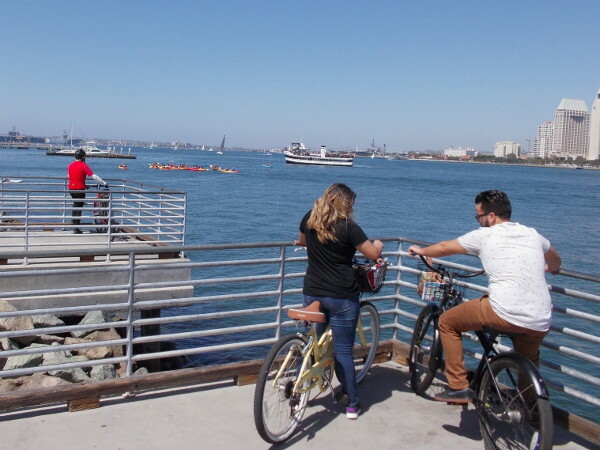 Posted on February 21, 2018 Tags amazing, art, beautiful, buildings, business, color, coronado, coronado ferry, gulls, history, mosaic, photo, public art, san diegoLeave a comment on Beautiful ferry mosaic on Coronado Walgreens. 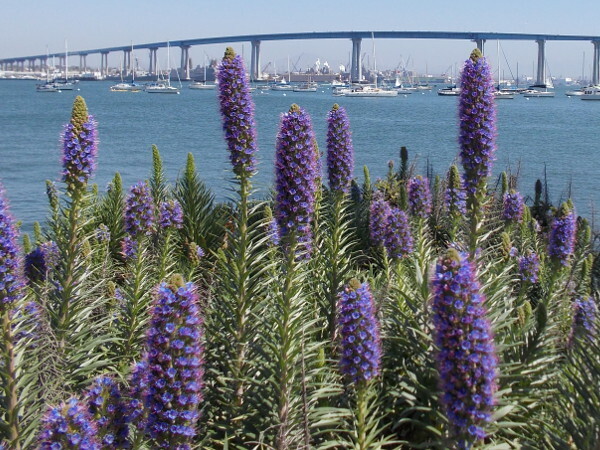 A fun walk: Tidelands Park to Coronado Ferry Landing. 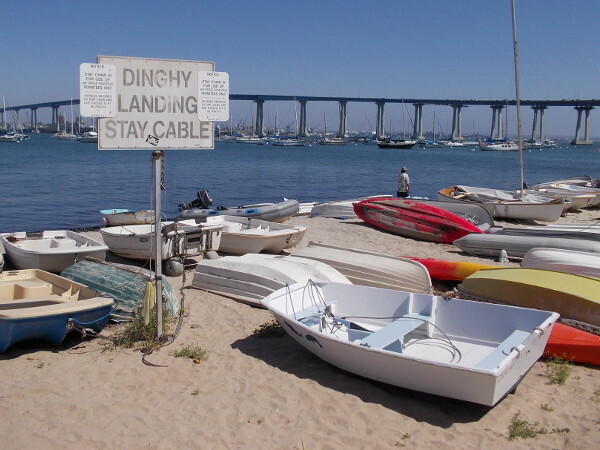 Dinghy landing’s colorful boats by San Diego Bay. 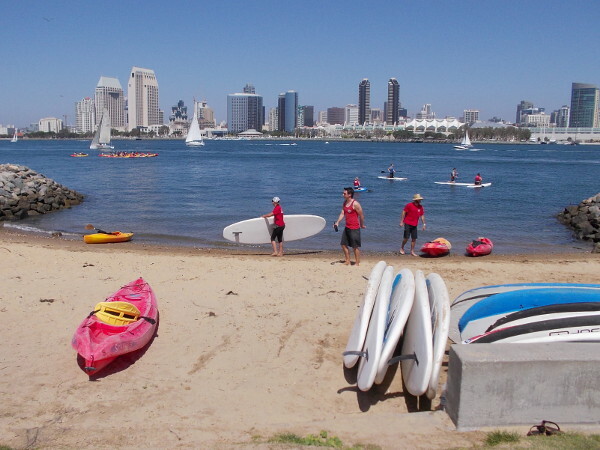 One end of Coronado Tidelands Park’s popular beach. Yesterday I took another fun, leisurely walk! 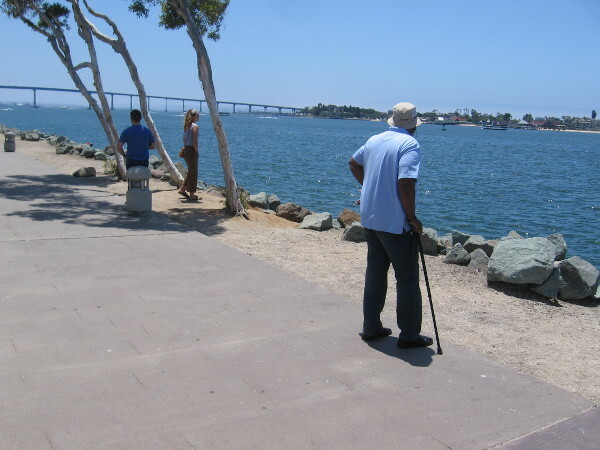 I went from the Coronado Bay Bridge end of Tidelands Park up the sunny Bayshore Bikeway to the Coronado Ferry Landing. And I took lots of pics, naturally! 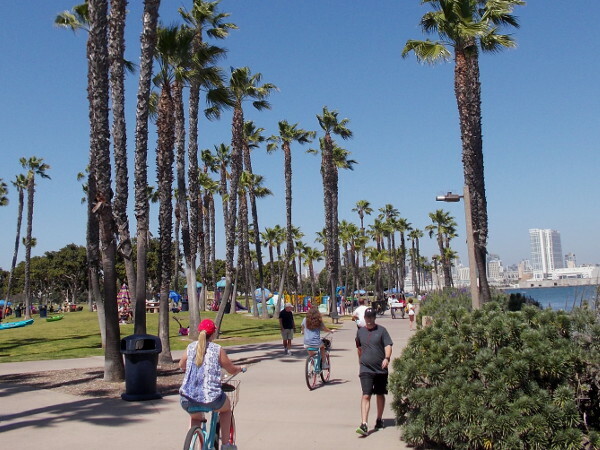 Perhaps you can see why Coronado is one of my favorite places. I feel very fortunate to live in San Diego. There are so many cool and beautiful sights. And I swear every day is amazing. 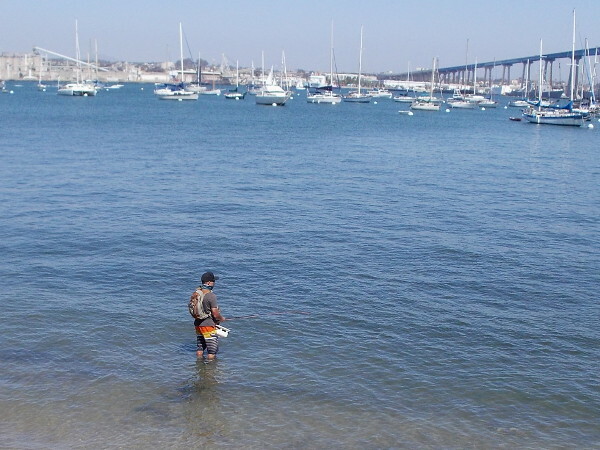 A guy wading in San Diego Bay tries his hand at some fly fishing. 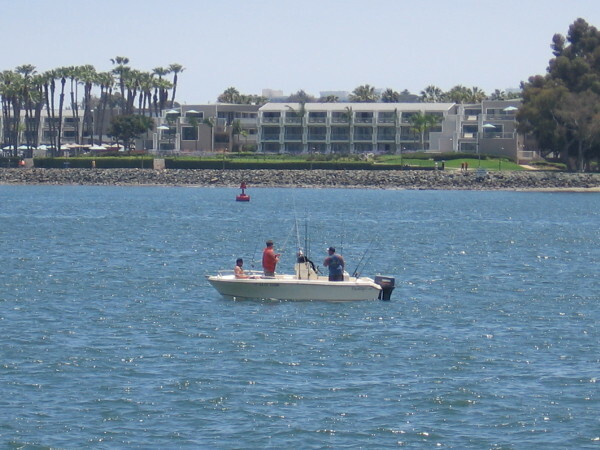 Moored boats (where some people live) and the San Diego–Coronado Bridge are visible. 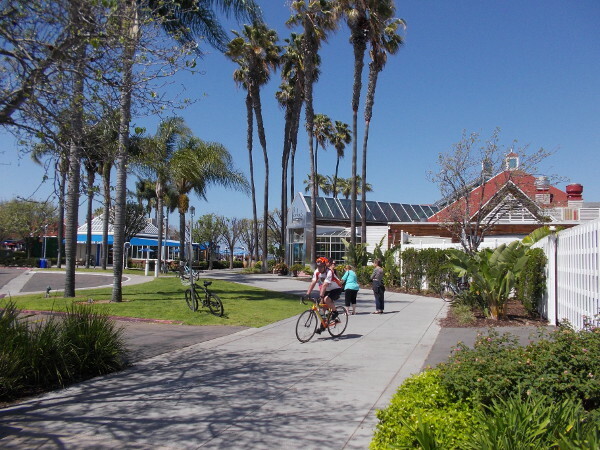 People walk and ride down the Bayshore Bikeway. 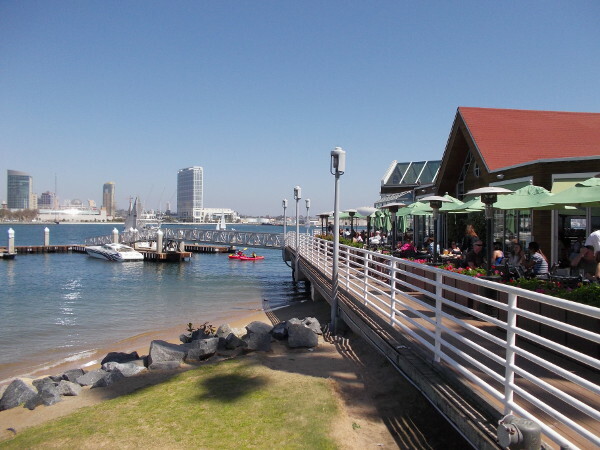 Head the opposite way and you’d go under the Coronado Bridge, then along Glorietta Boulevard and the Coronado Golf Course, then finally south down the Silver Strand. 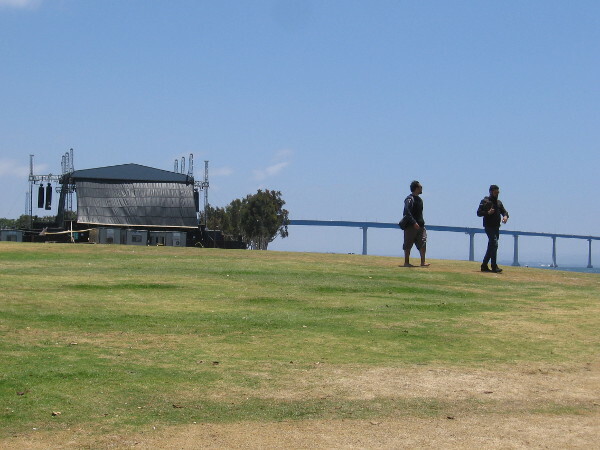 Skateboarders enjoy the City of Coronado Skatepark located at Tidelands Park. A fun, artistic seat that just had to be photographed. 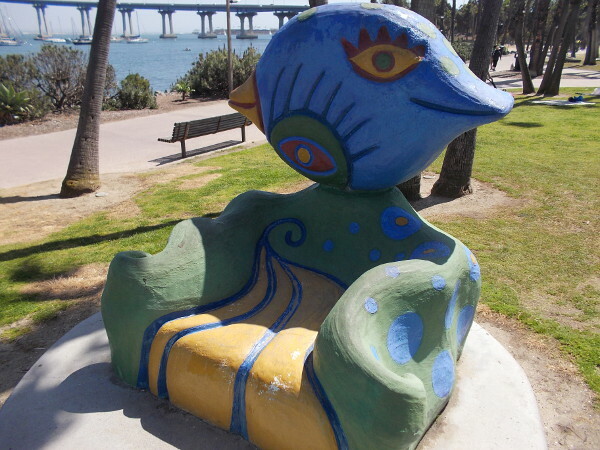 I discovered it at the edge of the Coronado Tidelands Park playground. Looking through purple blooms out at the blue bay during a leisurely Saturday walk. 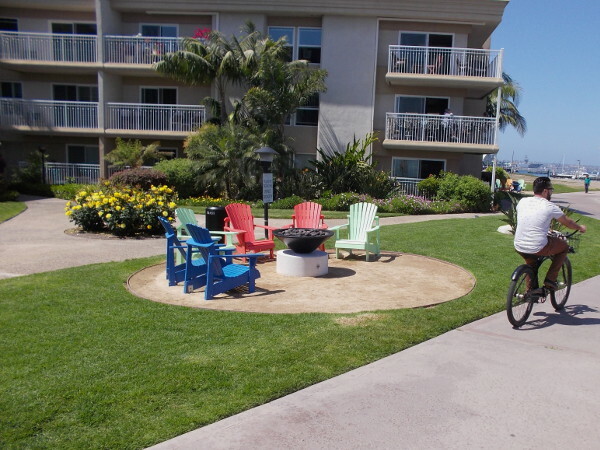 Colorful lounges and a fire pit for apartment dwellers near the Bayshore Bikeway. A fisherman caught something while I watched! 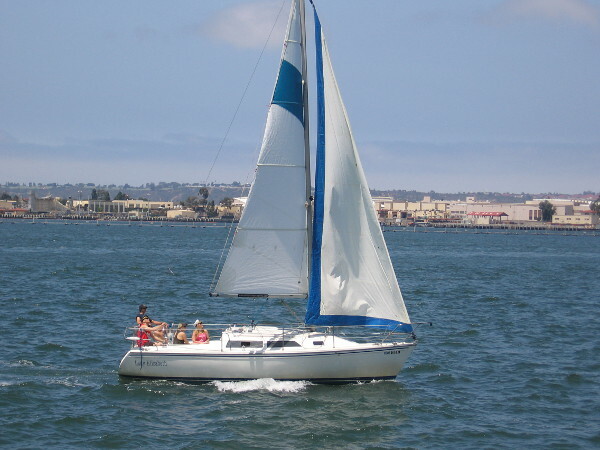 Lots of sailboats out on blue San Diego Bay today. These little bay overlooks with railings are popular spots to take in the scenery and sunshine. Look at all the weekend activity! 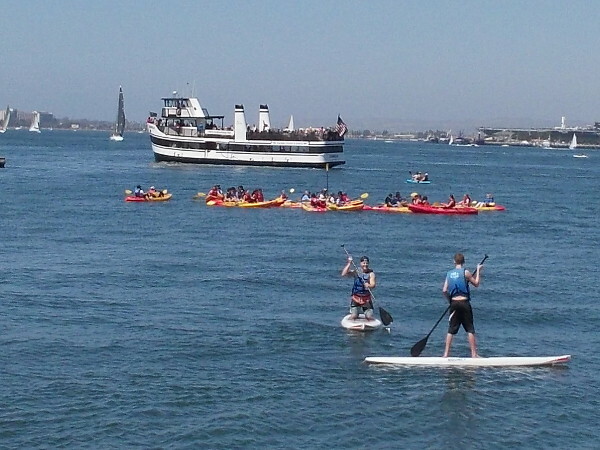 Standup paddleboarders, a big group of kayakers, and the Coronado ferry is coming in! Tourists and locals alike can rent watercraft on this little beach just south of the posh Il Fornaio restaurant. Perhaps you can see why this is one of my very, very favorite places! I’m so thankful to live nearby! 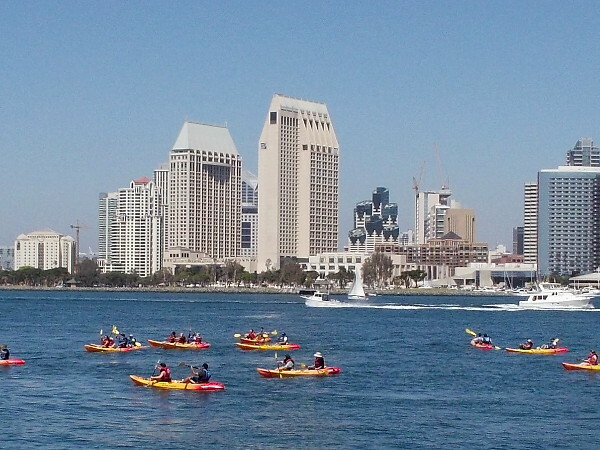 That big group of people in kayaks is rowing toward the Coronado Ferry Landing. The Manchester Grand Hyatt towers rise across the bay. 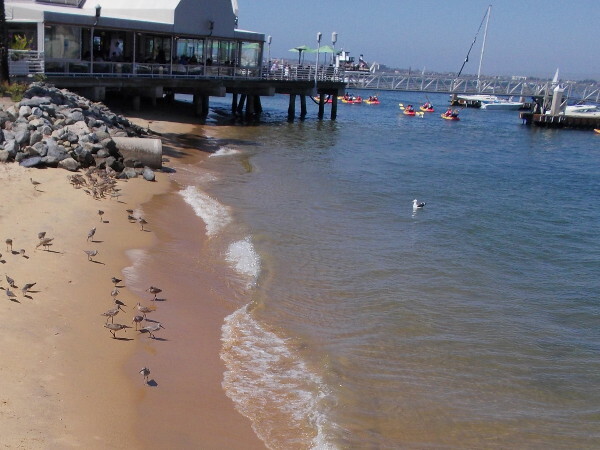 Shorebirds dot a little sandy beach just south of another fine Coronado restaurant, Peohe’s. Now we’re finally heading into the sunny Ferry Landing Marketplace. 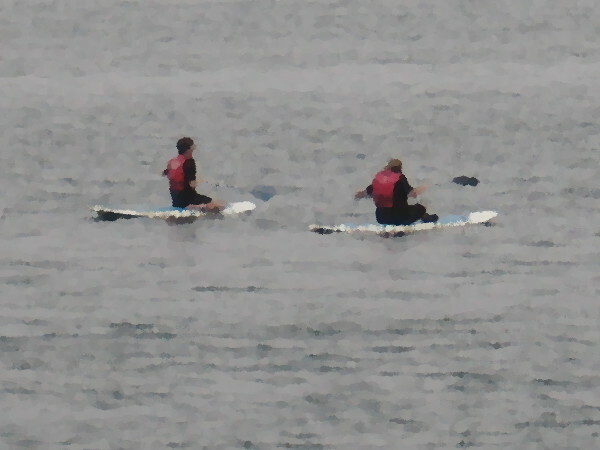 Some more kayakers are passing the dock at Peohe’s, as outside diners watch. Night views of downtown San Diego lit up across the water are awesome. 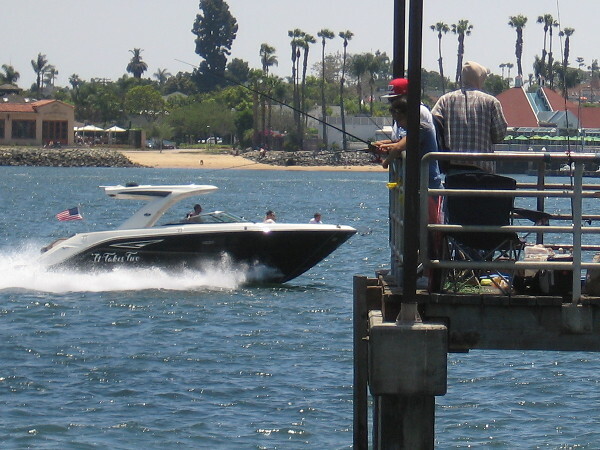 Some folks hurry to catch the Coronado Ferry! I think they just made it! 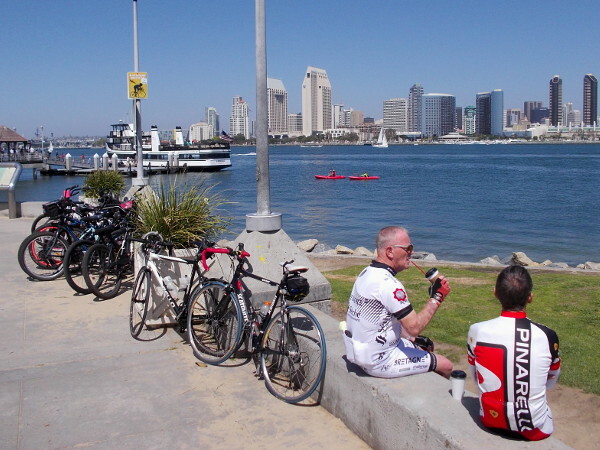 Bicyclists relax after a ride along the Bayshore Bikeway. Another perfect day. 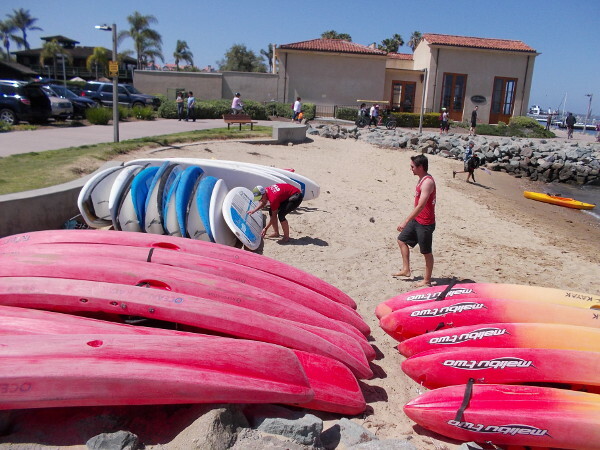 Posted on March 27, 2016 Tags boats, coronado, coronado ferry, ferry landing, fun, parks, photography, recreation, san diego bay, sunshine, tourism, travel, walking, water4 Comments on A fun walk: Tidelands Park to Coronado Ferry Landing. Mysterious morning light at the Broadway Pier. Orange and yellow logo of visiting Norwegian Sun cruise ship reflected on rippled water in San Diego Bay. A big rush this morning. But I had enough time to walk down to the Broadway Pier. Slowing myself for a few moments, breathing in fresh air, I was enchanted by the surrounding quiet, the growing morning light, and mysterious reflections. Bow and bridge of the Norwegian Sun, docked at the San Diego Cruise Ship Terminal. 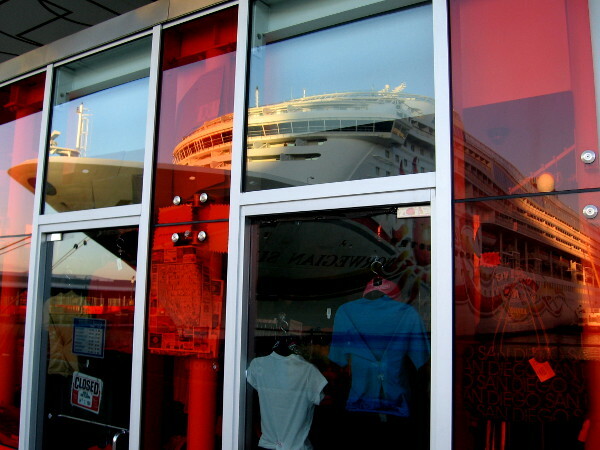 The image is reflected in the orange and clear windows of a nearby gift shop. Early morning light at San Diego’s Broadway Pier. 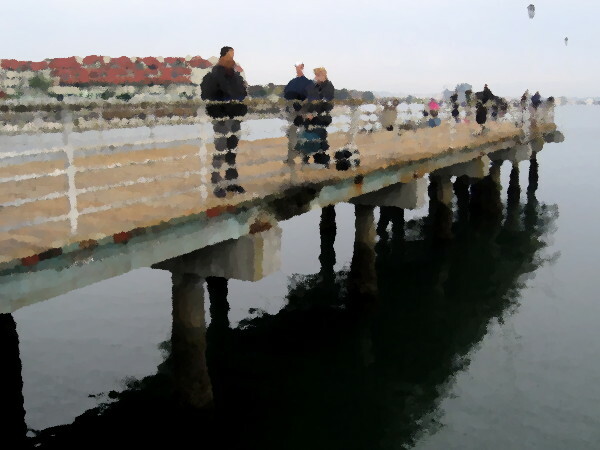 The Coronado ferry has begun another trip across the quiet, glassy water. 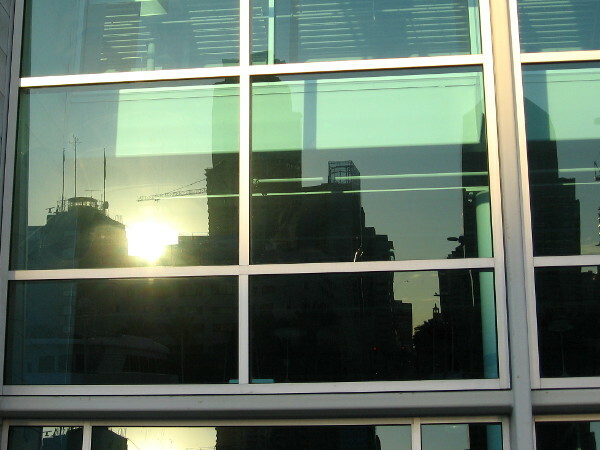 Reflection of downtown San Diego’s nearby skyline in the windows of the Port Pavilion. Photo taken as the sun climbs above building rooftops, from the Broadway Pier. Follow this blog for more mysterious photos! Join me on Facebook or Twitter. 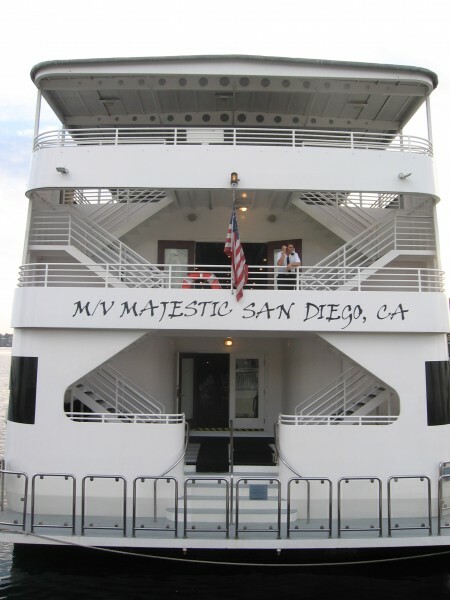 Posted on October 13, 2015 Tags broadway pier, coronado ferry, cruise ships, downtown, embarcadero, morning, mysterious, photography, reflection, reflections, san diego, san diego bay, sunrise, windows7 Comments on Mysterious morning light at the Broadway Pier. Old Coronado ferry ticket booth recalls history. 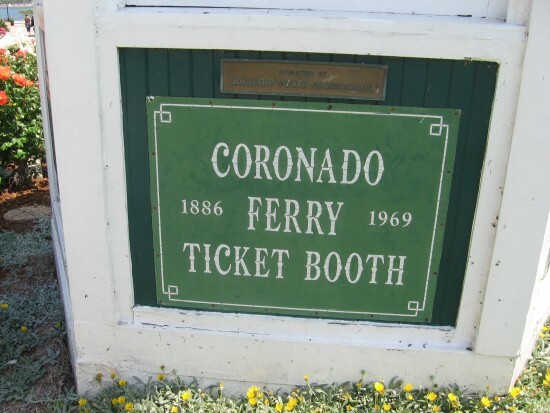 Original Coronado ferry ticket booth remains as historical artifact. 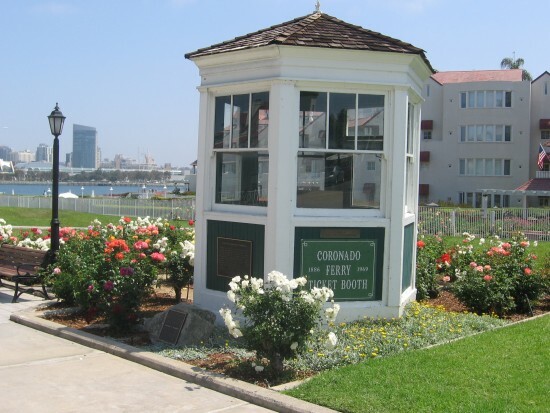 About a block north of today’s touristy Coronado Ferry Landing, you’ll find the old ticket booth of Coronado’s original ferry. 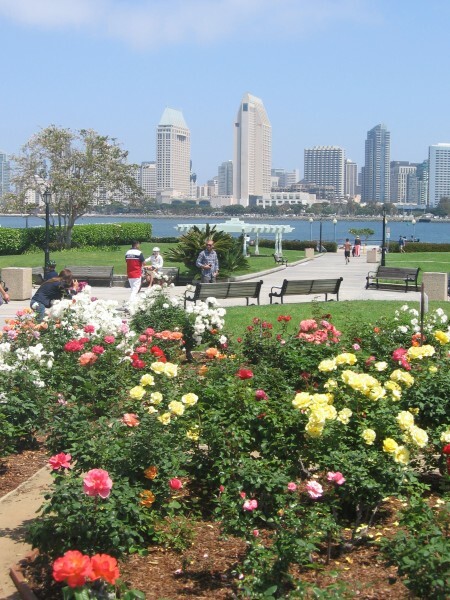 It stands beside a garden full of colorful roses and a pleasant walkway that runs from the end of Orange Avenue east to San Diego Bay. This beautiful area is called Centennial Park. 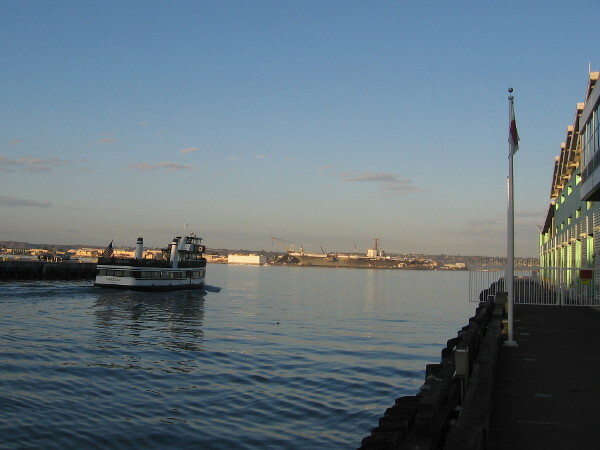 The original ferry was designed to transport horses and buggies; later ferries took automobiles across the bay. 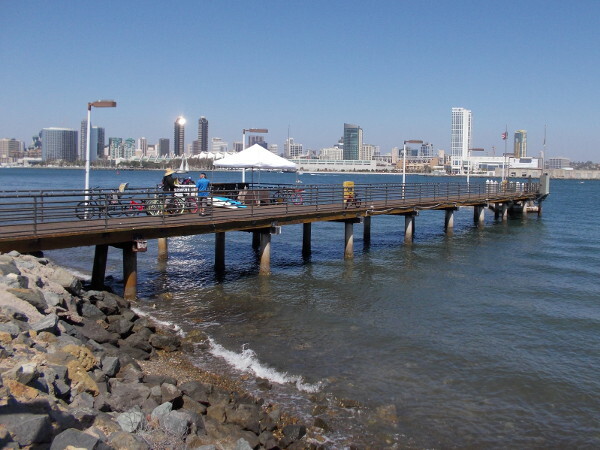 This vital link to downtown San Diego ran from 1886 to 1969, the year the Coronado Bay Bridge finally opened. Looking over roses near the nostalgic old ticket booth. Sign reminds passersby of nearly a century of history. 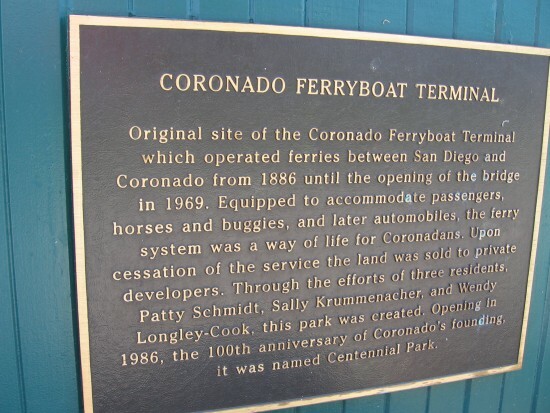 Plaque describes the history of the once vital Coronado ferry. 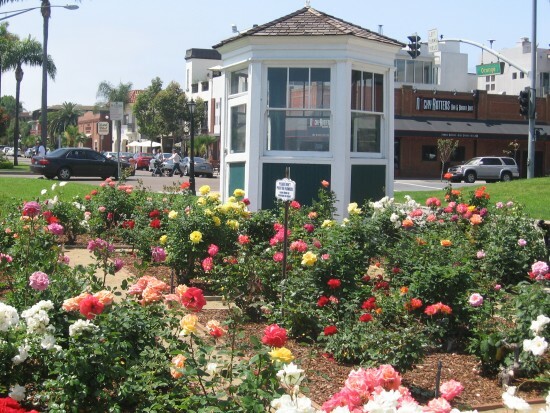 Old Coronado ferry ticket booth surrounded by flowers. Posted on April 21, 2014 May 20, 2017 Tags boats, color, coronado, coronado ferry, flowers, historic places, history, san diego bay, tourism, travel2 Comments on Old Coronado ferry ticket booth recalls history. Big yachts docked behind Convention Center. 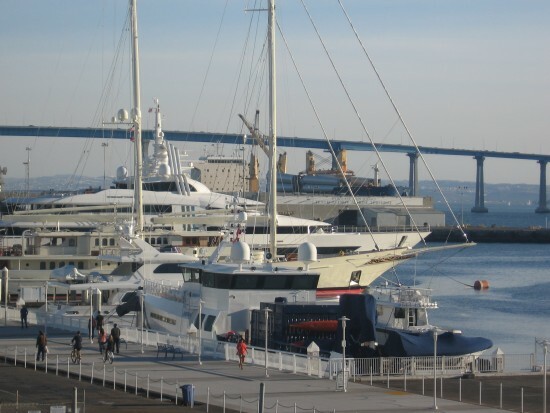 These private yachts are docked directly behind the San Diego Convention Center. Some can be really huge. Most are gorgeous. Over the years, I’ve seen a few that have helicopters or small airplanes! 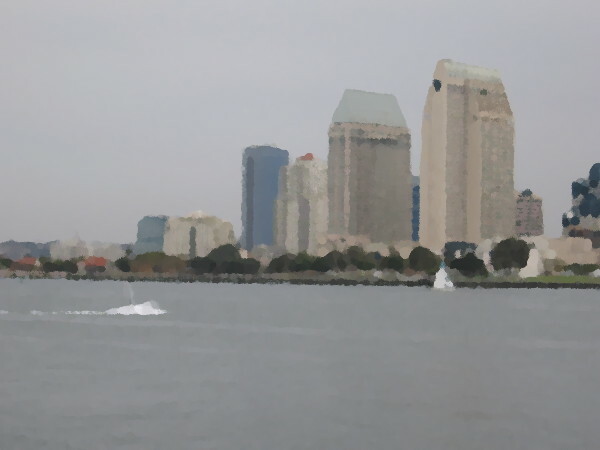 I took the above photo while riding the ferry to Coronado island. 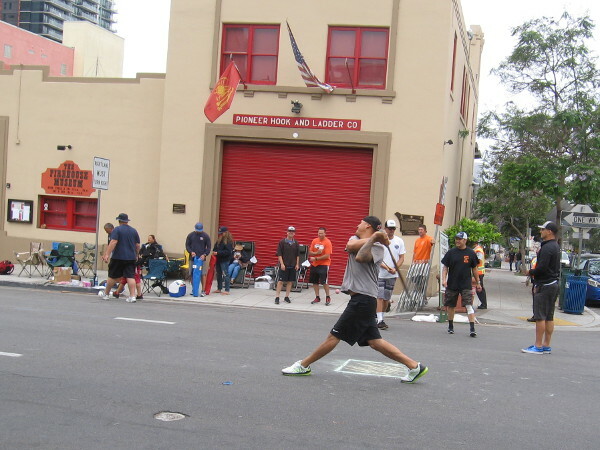 The building jutting up in the background is the Omni Hotel, which stands in the Gaslamp adjacent to Petco Park. 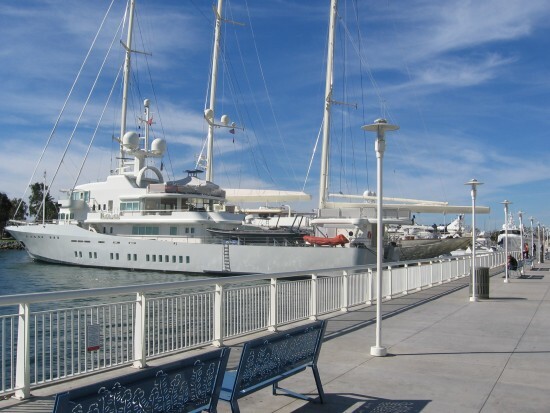 Large yachts docked behind convention center. Luxury yachts with Coronado Bay Bridge in background. 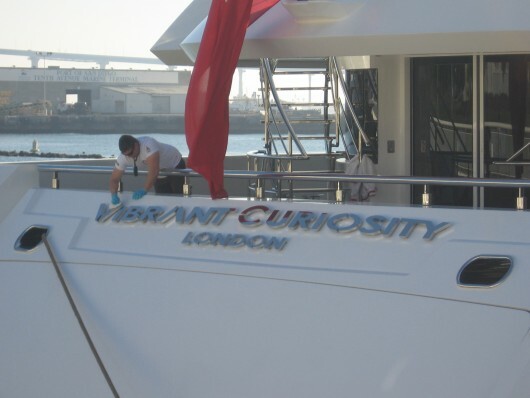 Crew member polishes Vibrant Curiosity. 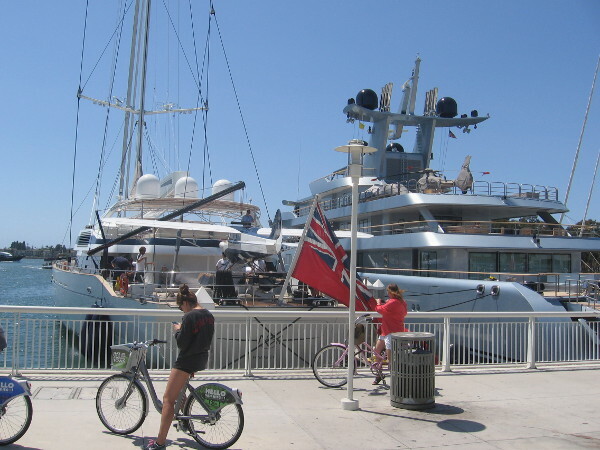 Rear of huge multi-level superyacht Majestic docked by convention center. 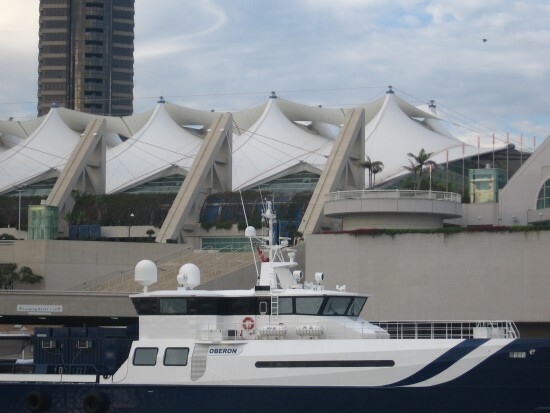 Oberon, a fast yacht support vessel, docked behind the San Diego Convention Center. 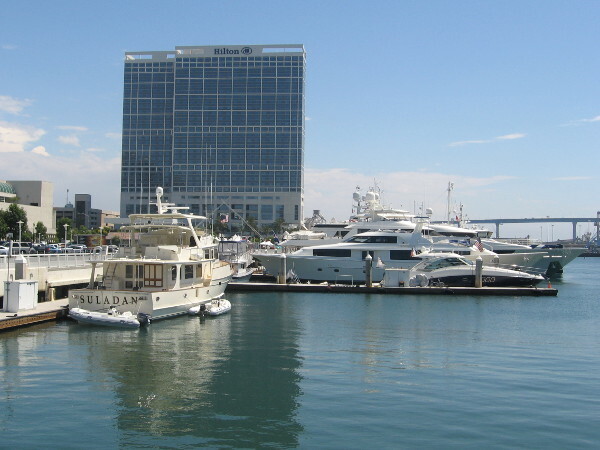 A row of private yachts docked in downtown San Diego. Looking south toward Hilton hotel behind San Diego Convention Center. Two super yachts with small aircraft seen in April 2015. On the left, the enormous single-masted yacht M5 boasts a seaplane, while the Pacific carries a helicopter. 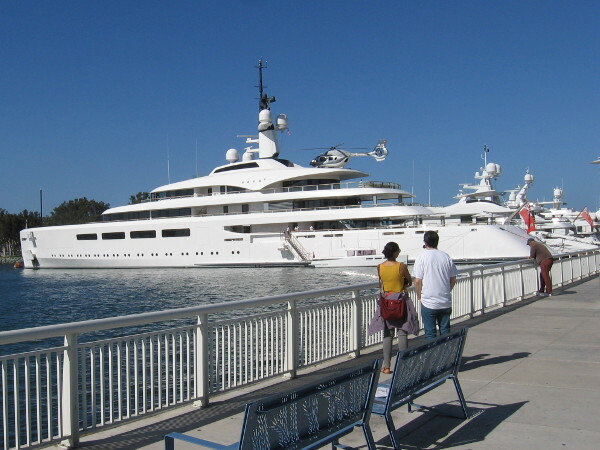 In October 2017 I saw Vava II, a 97-meter superyacht docked behind the San Diego Convention Center! 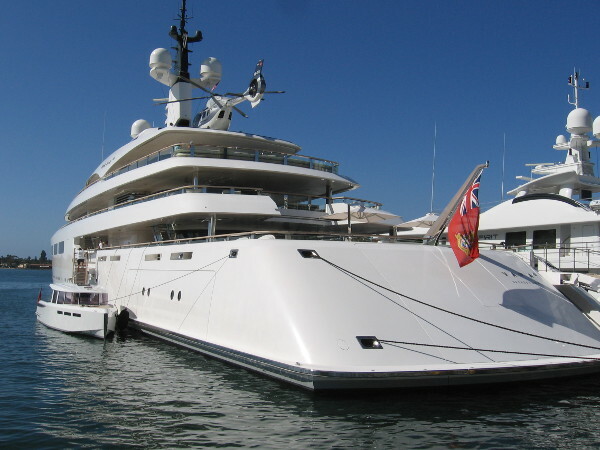 The Vava II, built by billionaire Swiss pharmaceutical tycoon Ernesto Bertarelli, is equipped with its own helicopter. The brand new, blue-hulled luxury superyacht Chirundos among other impressive ships docked in San Diego in late 2017. 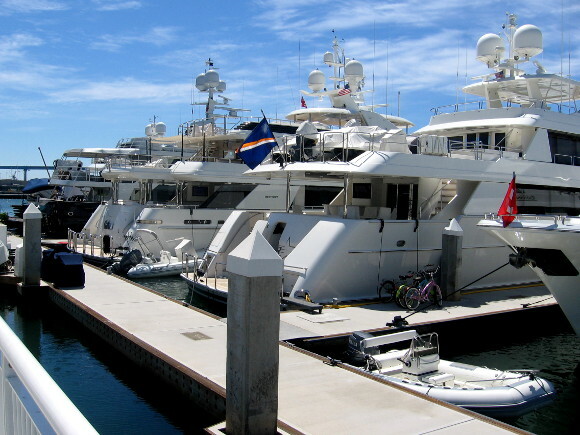 Beautiful yachts in a row behind the San Diego Convention Center. The sleek Attessa, with helicopter, docked in San Diego in early January, 2018. 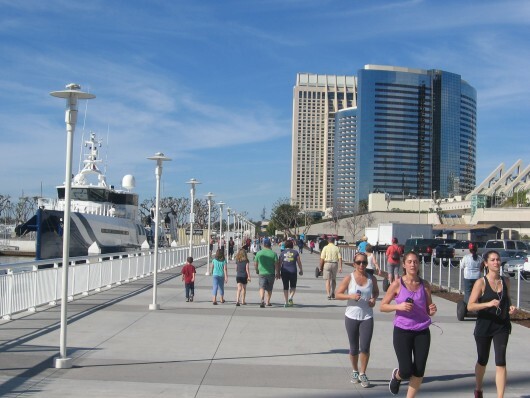 People walk and jog along the south Embarcadero. 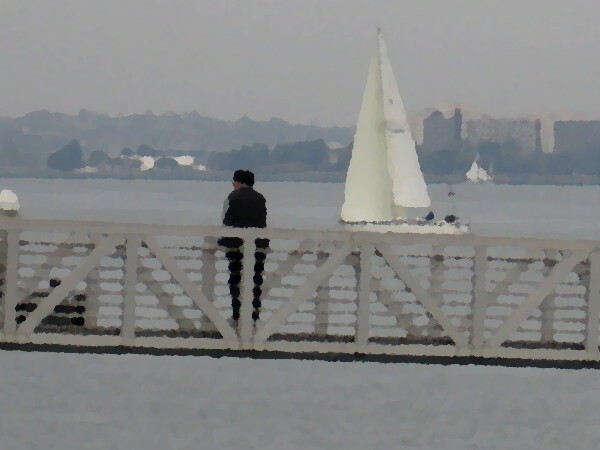 Posted on October 7, 2013 January 17, 2018 Tags boats, convention center, coronado ferry, hotels, photography, san diego, ships, yachtsLeave a comment on Big yachts docked behind Convention Center.